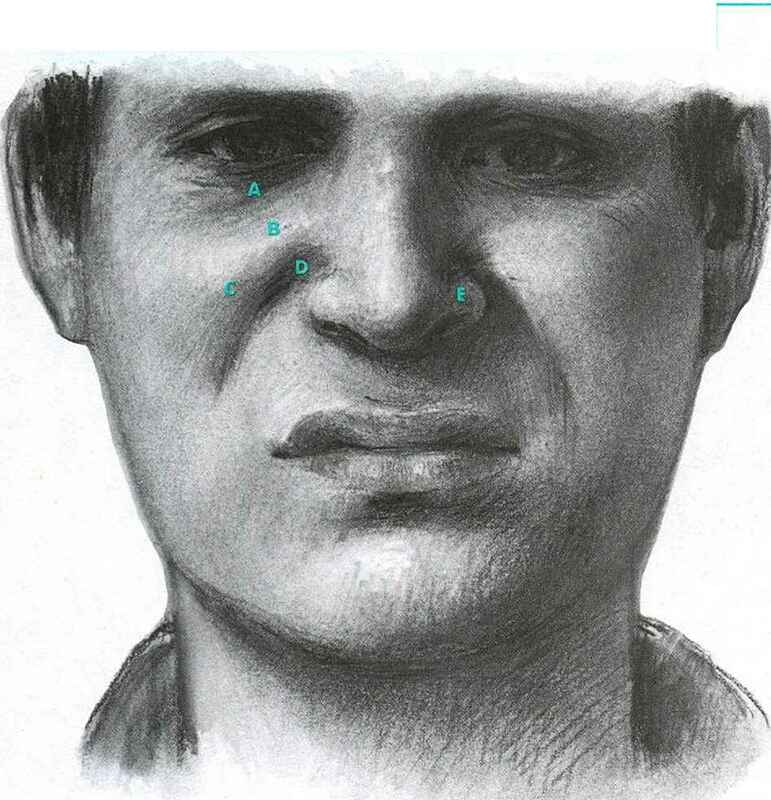 The levator labii superioris pulls the upper lip into a squared-off shape, the mouth of disgust. The sneering muscle pulls on the mouth indirectly: None of its strands attaches to the lips themselves. 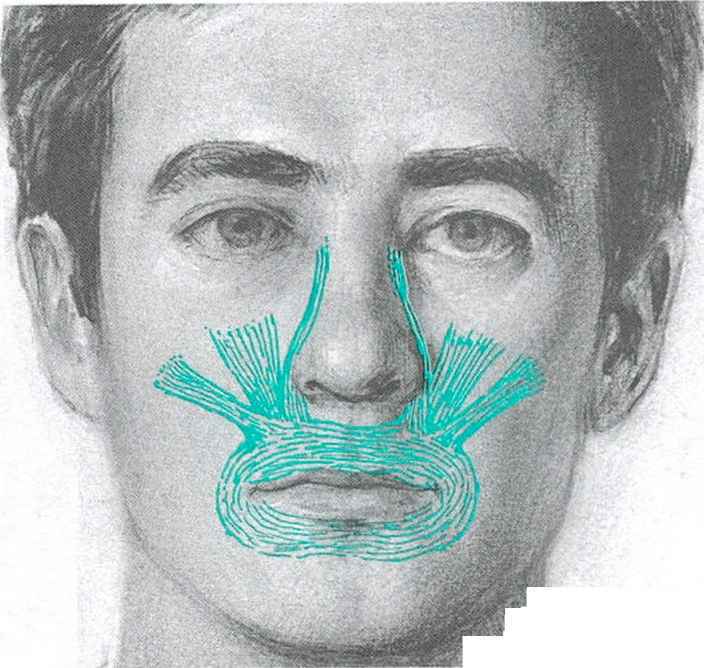 Instead, it attaches to the circular muscle of the lips (A), the nose wing, and the upper nasolabial fold (B). The upward pull on the skin and muscle surrounding the lips drags the lips upward as well. There are three independent sections, which can all accomplish the same task: The nasal branch is fixed alongside the upper nose (C); the middle branch is fixed underneath the eye socket (D). The last section, zygomatic minor, is treated by some anatomists as a separate muscle. It attaches on the corner of the cheekbone (E). look a great deal different depending on which branch is contracting. We'll describe the common element—the mouth—first, then look at the differences between the branches. The line between a sneering and a relaxed upper lip can be a fine one. Artists occasionally find themselves struggling to take the sneer out of a mouth without quite knowing how it got there. What should they know that would help them? First, don't bother redrawing the lower lip. The sneer only affects the upper lip, leaving the lower just the same. Second, watch the line of the upper-lip margin. The basic effect of the sneer is the same as pushing your upper lip flat against a piece of glass. The lip is flattened, pushed back, and widened. This changes the upper margin from "stretched M" to "square arch." The lip becomes more even in width and drops straight down to its corners, rather than tapering. Don't allow this shape to be approached if you want to avoid a sneer. As the upper lip curls upward, it lifts slightly off the lower lip. The lift is strongest in the outer ends of the lip, and here the gap between the lips widens. People often sneer with just one side of the lip. Then the changes are only seen on that side, and the other side remains relaxed. You can't sneer without redoing a bit of the upper face as well. Depending on which branch of the muscle you use, you may end up with a little bit of nose and cheek, or the entire face transformed, all from the simple fact of lifting the upper lip. You can demonstrate on your own face the difference between the two branches. An ordinary sneer uses only the middle branch, which takes less effort. But if you really put your heart in it and concentrate on wrinkling up the nose as well, you'll end up using the inner branch. You can feel the lift in the cheeks right across the face. Isn't it a lovely expression? The sneer pushes the upper lip back into the face, as well as pulling it upward. Note the change in the shape of the outer part of the lip; it no longer tapers, but is thick and even-shaped; it drops almost straight down to the outer mouth corner. The nose also has its wing lifted by the action. The muscle attachment is at (A). Anyone who teaches a portrait class will see students accidentally draw the mouth on the right. It doesn't take much. The sneer affects only the upper lip. It's pushed up and back into the face; more inner lip is exposed, so the whole lip looks thicker. A little crescent-shaped crease often appears above the middle. Above the lips, I've drawn the key to the difference. In the sneer, the M shape of the relaxed lip is squared off: (A) the middle has been thickened and (B) the corners have been squared off. Recall that the relaxed lip always tapers from center to outer corners: here you will note that is not the case—the lip appears equally wide throughout. 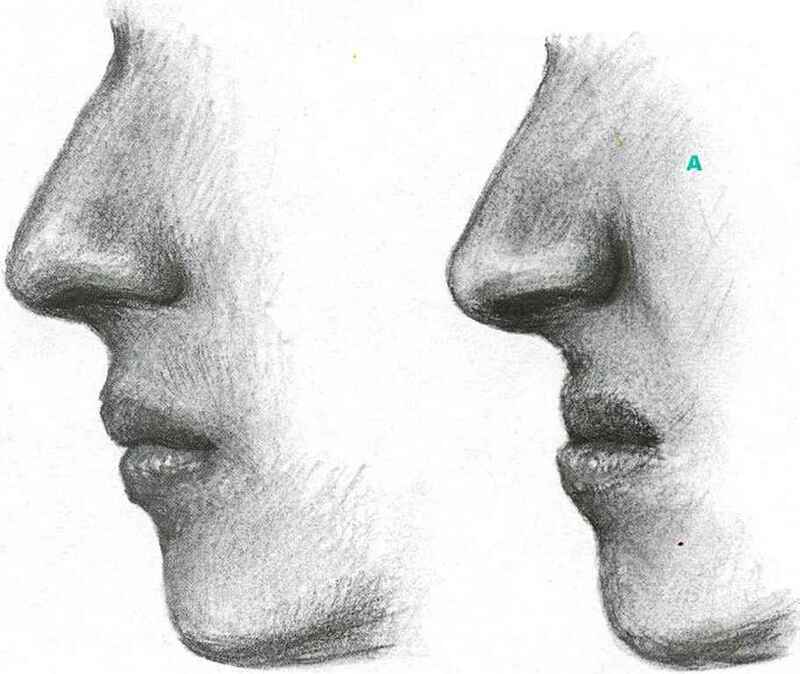 The difference in the upper halves of these faces (the lower halves are almost identical) is the difference in the actions of the two parts of the levator labii superioris. 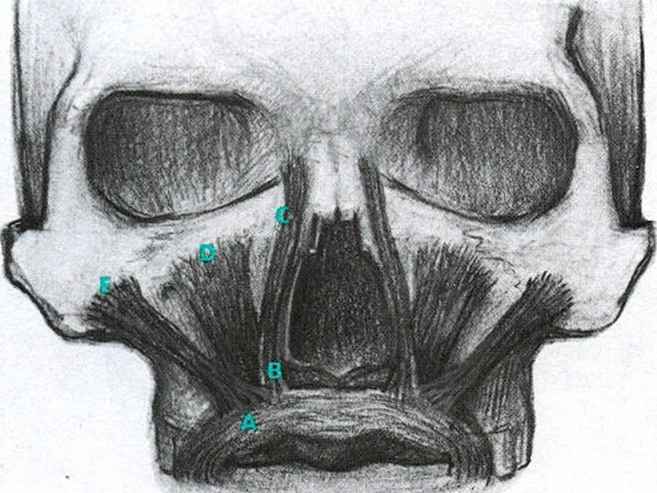 The inner, nasal branch of the sneering muscle (bottom) gives the face a crinkled-up look when it contracts, because its contraction triggers the orbicularis oculi and part of the corrugator. 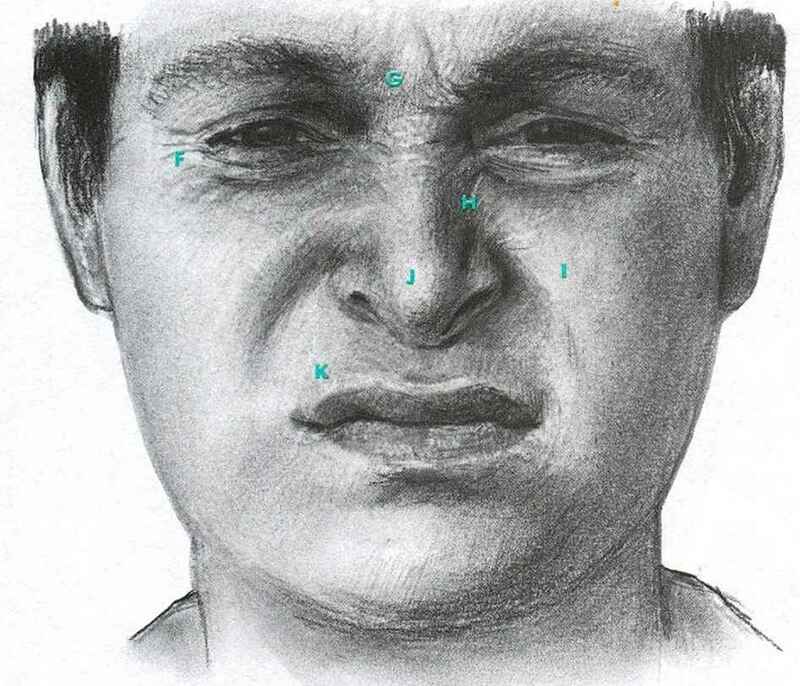 The middle branch of the muscle, if its pull is strong (top), puffs the cheeks and wrinkles the eye a bit. Both create the sharp, hooked crease around the nose, and both pull up on the nose wings. A. With strong pull, pushing up of cheeks "backs up" all the way to eye, creating crease along edge of eye socket. B. Middle branch fixed to bone here. C. Inner cheek bunched up in curved, vertical mound, thickest along nasolabial fold, fades out above and to the outside. D. Signature wrinkle of the sneer. Hook-like fold, deepest along nose wing, shallower below, with very sharp edges. Little hollow spot with ridge above often forms here. E. Wings of nose pulled up toward eye, pointing the nose downward. Muscle attaches to skin next to and on nose wing. F. Mild contraction of eye-circling muscle, orbicularis oculi, triggered by contraction of inner branch. Eye squints, and crow's feet, lower lid folds, and inner, star-shaped wrinkles appear. G. Eyebrows pulled down slightly by partial contraction of corrugator. Shallow vertical wrinkles appear between the brows, and star-shaped wrinkles below. H. Creases run alongside nose. I. Cheeks rise up all across face, but pile up deepest here. J. Nose pull very similar to above, but more straight up, pointing nose more. K. Mouth identical to above. How to lift up corner of lip in sneer? How to stretch levator labii superioris? Can only sneer one side? What facial expression is a single upper lip lift?